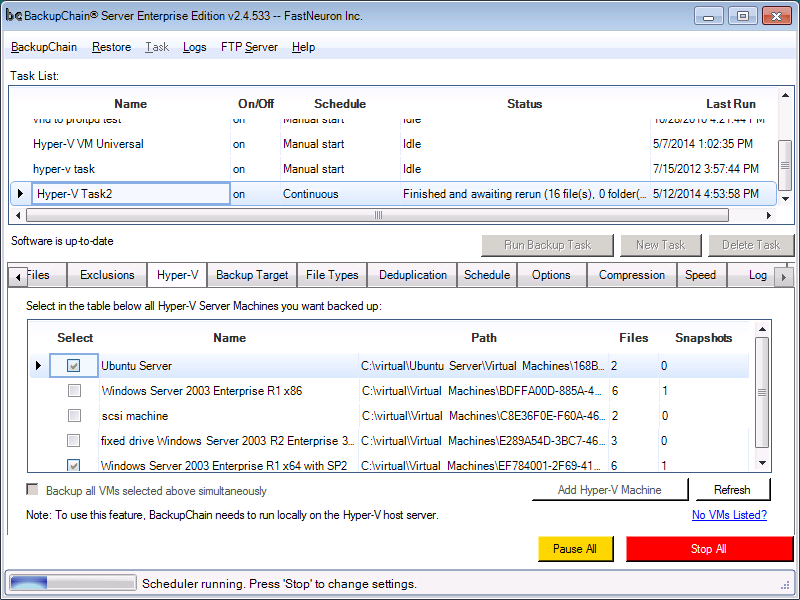 Hyper-V backup is now available on Windows 8 / 8.1 and offers many features that came from Windows Server. In BackupChain, all backup features available in Windows Server are also available on Windows 8, such as incremental and differential deduplication and a automatic disaster recovery for Hyper-V virtual machines. You can set up a schedule, email alerts, custom compression and dedupe settings, or simply accept all default settings and you’re set in about a minute. Deduplication will likely reduce storage usage by 80 to 95% each day, meaning that if the first backup was 100GB, each day following would be around 5 to 20 GB. Daily increments are usually 5% of the original’s size, depending on how much data was updated or added inside the VM that day. The restore process is quite simple, too, and may be done on a new host as well as on the original host. 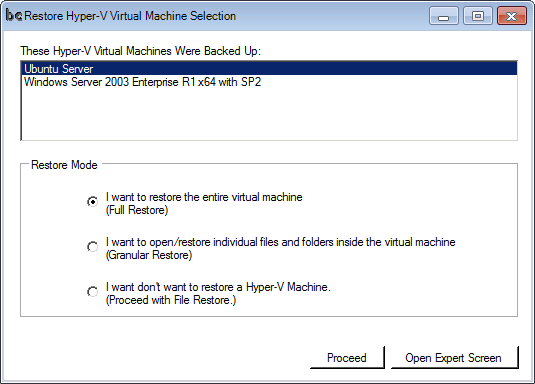 Side-by-side Hyper-V restore (cloning) using a new virtual machine identity is also offered in the Extraction Options. Hence, BackupChain may be used for replication and copy tasks as well. If you wanted just a single file or folder from inside a VM, you don’t need to restore the entire VM. 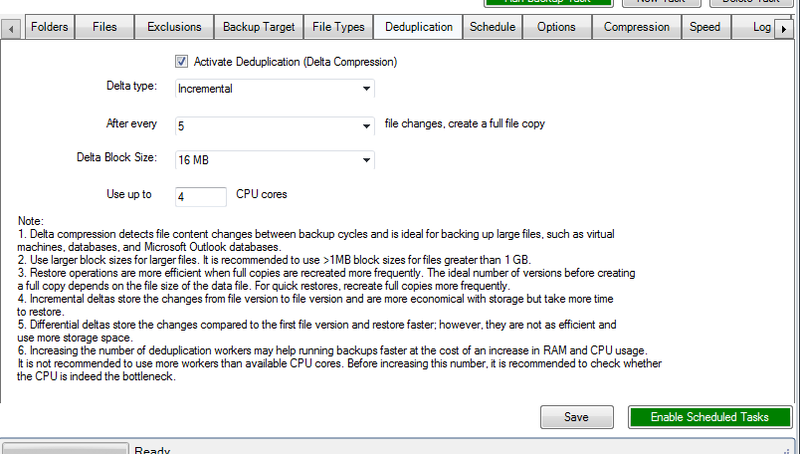 You would use Granular Restore (this is part of Server Enterprise Edition only) and open the VM immediately. This works on deduplicated backups, too, and requires less than a minute to open up. For a Full Restore, click Proceed. As shown above, we entered a test folder where all the files will be restored. This is highly recommended, especially when testing, so you can delete the entire folder when you are done. 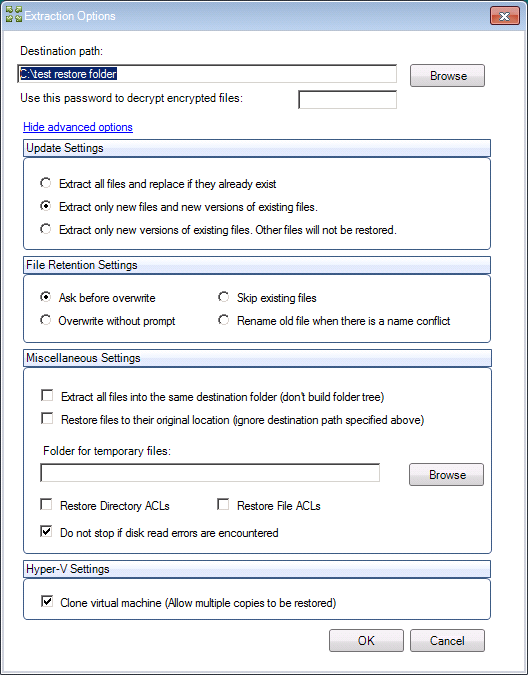 If you want a VM restored to its original folder, leave the destination path above blank and hit OK.
BackupChain Backup Software installs a PDF user guide with tons of walkthroughs, screen shots, and other useful info. Tech support is also available via chat and email during regular work hours (9-5 ET) in case you need assistance setting everything up. You also have the option to create a backup of virtual machines on your Windows 8 host over the internet using FTP and deduplication. Using the FTP server integrated in BackupChain you could even configure two hosts to receive each other’s Hyper-V VMs. Another typical scenario is to use an existing FTP server, such as a NAS, connected to the internet and send your backups securely encrypted, deduplicated, and compressed over the wire to an off-site location. The exact same tool and steps shown above work on servers, too. Your backups are compatible between different versions and editions of Windows. You can restore your Windows 8 VMs on a Windows Server 2008 R2, for example, and VMs hosted and backed up on a Windows Server 2012 R2 also restore using Windows 8. This interchangeability is unique to BackupChain, as is its FTP deduplication feature. 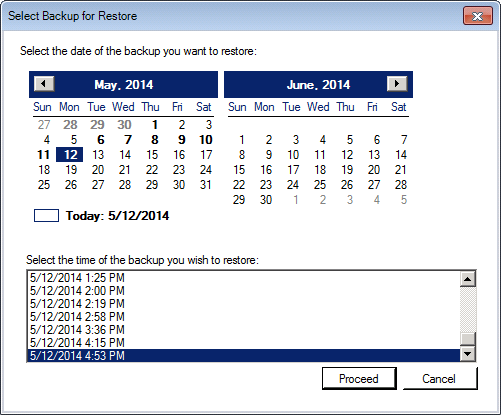 BackupChain offers complete Hyper-V backup on all versions of Windows interchangeably. It backs up VHD, VHDX, AVHD, AVHDX files, as well as snapshot and checkpoint files along with the VM’s configuration. 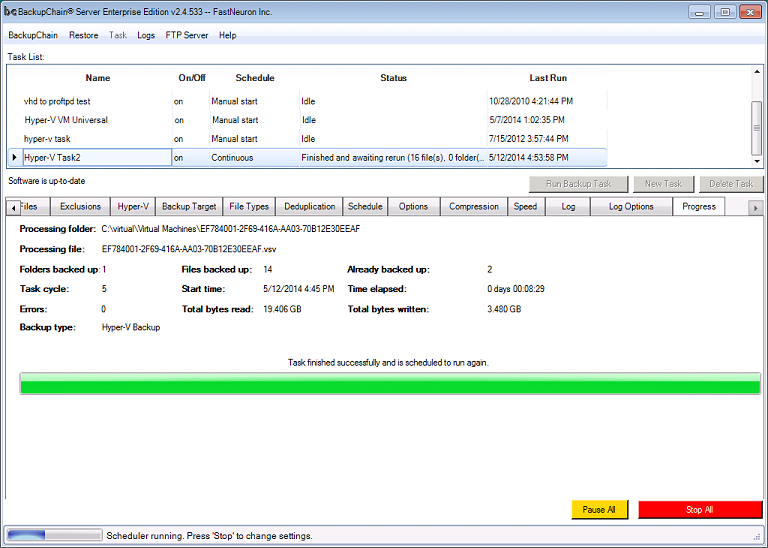 Backing up and restoring VMs takes only a couple of clicks and is fully automated. VMs backed up on a server host may be restored on a PC host and vice versa.